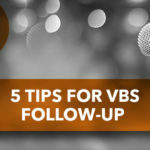 Begin with your VBS dates and work your way backwards. It’s amazing what you can accomplished by breaking the work to be done into small parts. It keeps the workload from getting overwhelming and reduces the stress on everyone involved.